His perseverance and adaptable character allow him to adjust to the many twists and turns that often develop when undertaking a project. His attention to detail as well as his social, sales and negotiation skills offer him a competitive edge when closing a business transaction, such as the purchase or sale of real estate. The Quebec real estate industry has become one of the most competitive professional industries in the province, but only a small percentage of brokers are keeping up with the times, harnessing the power that technology has to offer and adapting to the ever more demanding consumer. Julio realizes that in this millennia people are aware and educated due to the proliferation of information, this allows him to understand what people want from a real estate broker… And he delivers! 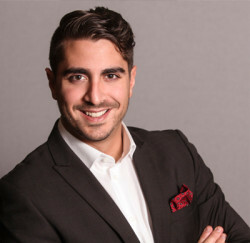 Julio is a member of the Organisme d’autoréglementation du courtage immobilier du Québec (OACIQ) and the Greater Montreal Real Estate Board (CIGM).